This stunning twelve-track collection features Pickett’s gritty soul stylings. With wonderful production and arrangements, Pickett howls classic staples including “Mustang Sally,” “Knock On Wood,” “Sunny” and “Three Time Loser.” “Mustang Sally” is included on Rolling Stone’s “500 Greatest Songs of All Time.” The Wicked Pickett is a diverse listen, sure to please fans with its wide range of endearing ballads and up-tempo dance numbers. 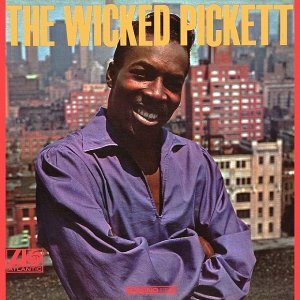 A fabulous album, done when Pickett was in the midst of his best period at Atlantic. It had everything -- great songs, wonderful production and arrangements, and a hungry, galvanizing Wilson Pickett hollering, screaming, shouting, and soaring on anything he covered, from ballads to uptempo dance and midtempo wailers. It also has been deleted at present.